New in 2019 from Linda Rick, this 12 inch beauty is sure to be a keepsake your little one will treasure forever. This adorable beauty from Precious Moments is ready to snuggle up with your little one. 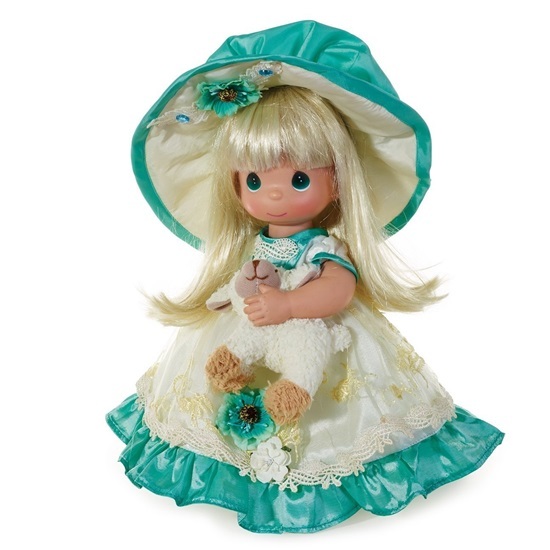 In her beautiful ivory and green dress with ruffles and lace, this sweet blonde girl is holding a plush little lamb. She is 12 inches tall and her head, arms, and legs are jointed. She has green tear drop shaped painted eyes. A matching hat, and yellow mary janes complete this refreshing springtime ensemble. She is perfect for ages 14 and up.